﻿Bruce Goodman's "Rattan place mats"
Freda must have spent a good hour in the shop looking for nice table place mats with matching coasters. They were to be a gift for Alexandra. Alexandra was turning fifty, and Freda had been invited to the party. Alexandra’s taste in dining ware was legend. She had such stringent exactitude! By buying place mats with matching coasters, Freda was entering dangerous territory. 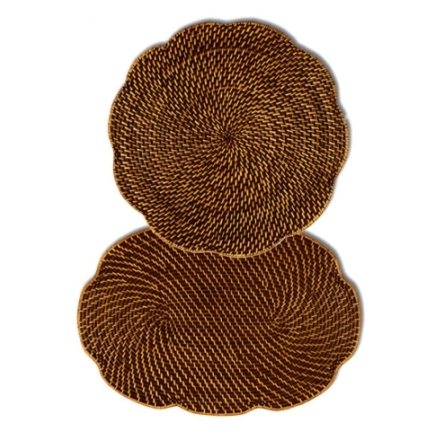 Finally, Freda selected beautiful rattan place mats and coasters. Very classy! The party came and went. Freda’s gift was placed, wrapped, on the gift table. That was the last Freda heard of her gift. No phone call. No thank you card. Nothing. Even when Freda bumped into Alexandra in town (you must pop in for coffee sometime), no mention was made of the gift. Freda believed that Alexandra’s silence on the matter implied that the table mats and coasters didn’t quite measure up to the high standard required. A little while later, Freda made good her promise to visit Alexandra for coffee. Would you believe! The place mats and coasters were set on the dining table!